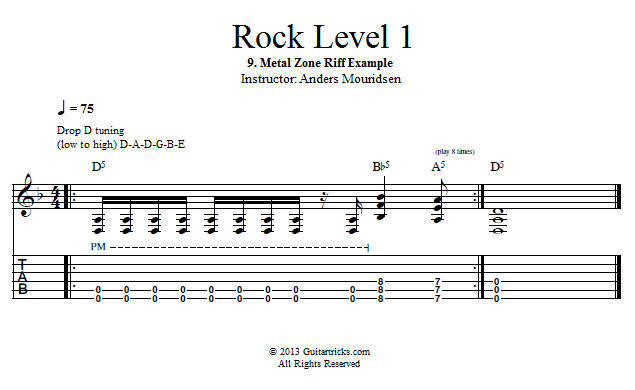 In this lesson I'll show you an example of how this metal sound can be used in a rock context. Try to see if you can dial a similar sound with whatever gear you have. This includes a new trick called "Drop D", where you tune your low E string down to a D note by matching the 7th fret of the E string to the open A string. This enables us to play low droning one-finger power chords, and it's a really heavy trick! I hope you've realized how many different sounds you find under the umbrella of "gain". Which one you choose to use has a huge impact on your overall sound, both from the actual tone of it but just as much from how it makes you play. The RAT adds the cool sustain which will make you want to hold out notes much longer than you would if it faded out quickly. The Fuzz does the cool "weird" sounds when you play multiple notes at a time, so you'll be more inclined to use those tricks when you're using it, and so on. So it all comes down to finding a gain sound that's right for you; where you like the way it sounds, and it makes you play well! So have fun exploring that, and I'll see you in the next video.